Techno Brain has partnered with Serenic Software, a global provider of financial and business management software products to satisfy the unique requirements NGOs and NFPs. 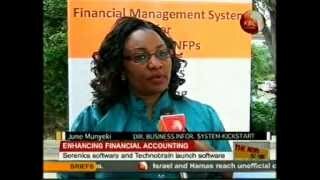 The Techno Brain is a key Serenic Navigator 2016 provider, the leading fund accounting software designed to effectively and efficiently meet the client’s needs. Serenic’s Navigator 2016 product offers several new capabilities over prior versions and over Dynamics NAV. Serenic's products are based on Microsoft products and technologies, and are marketed in alliance with Microsoft Business Solutions. A full suite of operational software designed specifically to meet a nonprofits’ unique budget, fundraising, donor, and grant management processes. Reliable, proven performance that will free you and your team to focus on accomplishing your goals and completing critical milestones. Complete integration that will provide budgeting and expenditure transparency and accountability required to manage awarded funding, grants, programs and projects. Compatibility with your business processes across departments and funding organizations. Multiple language and currency tools to record and display transactions for estimates, obligations, and subawards in different currencies and appropriate languages. The ability to set up budget approval requirements prior to posting to a G/L, and budget “what if” calculation scenarios for improving accuracy and planning. Integration with Serenic AwardVision, our grant management solution that ensures funder restriction compliance, accurate grant reporting, totals for award estimates and obligations, and individual subawardee monitoring (additional purchase required). Empower your organization with fund accounting software that helps you focus resources on what’s most important. Built upon the stable and scalable foundation of Microsoft Dynamics NAV 2016, Serenic Navigator delivers new levels of value, efficiency, and productivity. Our tools for quality reporting, grant management, and budgeting enable clear operational visibility to uncover actionable insight – for true accountability and maximum impact. Enable employees to be more productive – With Role Centers, employees have a clear overview of the tasks and information most relevant to their work responsibilities – all customized to meet specific needs based on job function and personal work style. Proactively track specific programs or projects in real-time through dimensions, funds, and budgets – Serenic Navigator supports relational data for easy reporting through our logical chart of accounts, where each data field works independently but is validated with internal relations. Dimension IDs which are maintained separately, can be assigned to a journal line, document header, or document line for improved performance. Budget, track and report on personnel expenses by projects or against specific funds – Ensure compliance with spending restrictions and automatically send time worked directly to Serenic Navigator Payroll or export to a third-party product. Send expenses entered by employees to the Purchase Journal – Streamlines the expense entry and reimbursement process for you and your employees. Proactively track expenditures against user-defined budget rules – Enables your staff to anticipate, not react; reduces confusion. Automatically balance funds and fund classes – Make more confident decisions based on more accurate, more current information. Increase efficiencies with forward-looking actionable information – You need more than just a system of record. Serenic Navigator gives you strong procurement controls, alerts, charts, and budgeting and forecasting tools. Get instant access to critical financial information across any timeframe or data table – No budget surprises; make more timely decisions with cross-period reporting. Eliminate tedious and expensive paper-based approvals – Streamline the process through workflows which allow you to focus on completing your project on time; reduces costs. Administer modifications and update milestones to awards, grants and contracts as needed – Increases accuracy and accountability throughout the project. Allocate expenses in real-time to increase data accuracy and timely completion of reporting – Identifies and avoids budget overruns before data is posted. Provide anytime, anywhere accessibility with harnessed insight – Access real-time data via Windows, the Web or Microsoft SharePoint. Limit user access with role-based security. Naples Airport (NAA) engaged Techno Brain to help evaluate the gaps between what they needed to operate effectively and efficiently and how the Dynamics NAV software functioned. The Techno Brain team provided NAA an objective analysis and ultimately recommended Serenic Navigator 2016, the leading fund accounting software for not for profits to effectively and efficiently meet the client’s needs. Serenic’s Navigator 2016 product offered several new capabilities over prior versions and over Dynamics NAV.